When the Colombian architect Santiago Medina Mejia built Casa Medina in 1946 in Bogotá, he filled the apartment block with stone columns, floorboards, and hand-carved wooden doors salvaged from demolished convents. 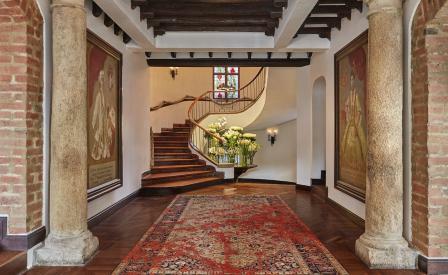 With just 62 rooms, the hotel’s masculine furnishings are courtesy of interior designer Lauren Rottet who has complemented the original slanted beamed ceilings, sweeping lobby staircase, fireplaces, and convent doors with Chesterfield lounges, geometric patterned rugs, and mirror-clad travellers’ trunks. The sunny courtyard is now topped with glass and converted into the all-day Spanish diner Castanyoles, though it would be churlish to bypass the spectacular gastronomic offerings at the hotel’s doorstep in Zona G.